Dust storms and thunderstorms wreaked havoc in Uttar Pradesh, West Bengal, Andhra Pradesh and the national capital, killing at least 41 people and leaving behind a trail of destruction. NEW DELHI: Dust storms and thunderstorms wreaked havoc in Uttar Pradesh, West Bengal, Andhra Pradesh and the national capital, killing at least 41 people and leaving behind a trail of destruction. Uttar Pradesh bore the brunt of a thunderstorm and hail that left at least 18 people dead, while 12 people including four children were killed in West Bengal, nine in Andhra Pradesh, and two in Delhi, officials said. According to the India Meteorological Department, thunderstorms also occurred at isolated places in Himachal Pradesh, Uttarakhand, Punjab, Haryana, Chandigarh, Madhya Pradesh, Jharkhand, Assam, Meghalaya, Maharashtara, Karnataka, Kerala and Tamil Nadu today. In a tweet, Prime Minister Narendra Modi said: "Saddened by the loss of lives due to storms in some parts of the country. Condolences to the bereaved families. I pray for the speedy recovery of those injured." Condoling the deaths, Congress President Rahul Gandhi in a tweet asked party workers to provide all assistance to the bereaved families. At least 18 people have been reportedly killed in lightening strikes in Andhra Pradesh, Telangana and West Bengal today. My condolences to their families. I urge Congress party workers to provide all possible assistance to the bereaved families. Today's devastation comes over 10 days after storms hit UP, Rajasthan, Telangana, Uttarakhand and Punjab, killing 134 people and injuring over 400. UP was the worst affected, accounting for 80 deaths, most of them in Agra district in the western part of the state. At least 18 people were killed and 28 injured in hail and thunderstorm that pummelled parts of Uttar Pradesh, officials said. Five people were killed in Kasganj, three in Bulandshahr and two each in Ghaziabad and Saharanpur. One person each died in Etawah, Aligarh, Kannauj, Hapur, Noida and Sambhal, Principal Secretary (Information) Awanish Awasthi said. A squall and dust storm with a wind speed of up to 109 kmph battered Delhi and neighbouring areas today, killing two persons and injuring 18 others, and throwing flight, rail and metro operations out of gear. 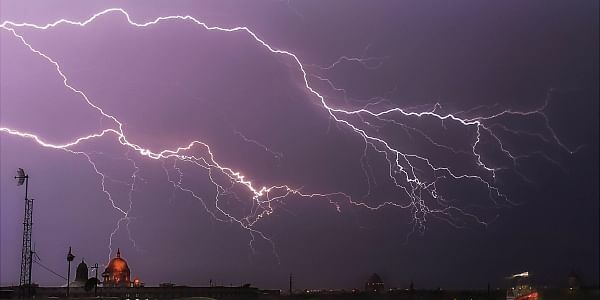 In West Bengal, at least 12 people, including four children, were killed and over 15 injured in lightning strike amid heavy rain, an official of the state disaster management department said. In Andhra Pradesh, nine persons were killed in lightning strikes. While seven persons were killed in Srikakulam district alone, two more were killed in Kadapa, officials said. Various parts of the southern state witnessed rain, accompanied by gales. In Delhi, the sky turned dark grey around 4:30 pm. The much-needed reprieve came after a sweltering day, when the maximum temperature had reached 40.60 degrees Celsius, a notch above the normal. Humidity during the morning hours was recorded at 60 per cent, a MeT official said. The officials said two squalls whipped through the national capital. One clocking 109 kmph hit the Safdarjung area at 4:44 pm and continued till 4:46 pm. The other gusting to 96 kmph battered the Palam area at 4:33 pm. The strong winds knocked down nearly 200 trees in the city. Incidents of wall collapse were reported from Najafgarh, Transit Camp, Nehru Place, Mohan Garden in Uttam Nagar and Raj Nagar in Palam, said a senior officer of the Delhi Fire Service. A man was crushed to death in a wall collapse, while a woman was killed when a tree uprooted and fell on her, the police said. Traffic in many areas moved at a snail's pace due to the reduced visibility. The inclement weather interrupted the launch of a 140 kWp rooftop solar plant at IP Extension attended by Chief Minister Arvind Kejriwal. Operations at the Delhi airport came to a halt due to the dust storm. At least 40 flights were diverted and more than 24 delayed, an official said. Metro operations were affected at a number of stations on the Violet and Blue lines after trees fell on overhead electricity (OHE) wires. A few passenger and freight trains were held up for around 25 minutes because of the disruption. The Kalka-New Delhi Shatabdi Express was also stopped near Sonepat due to uprooting of trees. According to MeT department officials, the Safdarjung Observatory gauged 8.3 mm of rainfall. The Palam, Aya Nagar and Lodhi Road areas recorded 0.8, 6.4 and 2.1 mm of precipitation. The weatherman forecast partly cloudy skies and light rainfall tomorrow. K Sathi Devi, the head of the National Weather Forecasting Centre, said two western disturbances had led to the inclement weather. "A cloud mass passed over Delhi. The extreme weather not only affected Delhi; Panipat, Jhajjar, Rohtak, Jind in Haryana and parts of Uttar Pradesh," said G P Sharma, President (Meteorology) Skymet, a private weather forecasting agency. The winds continued to gust to 70 kmph even after the cloud mass passed over Delhi. Sharma and Devi warned of similar weather conditions tomorrow. Thunderstorm and dust storm with winds speeds of up to 70 km per hour are "very likely" tomorrow in 26 districts of Uttar Pradesh, the weather office warned.